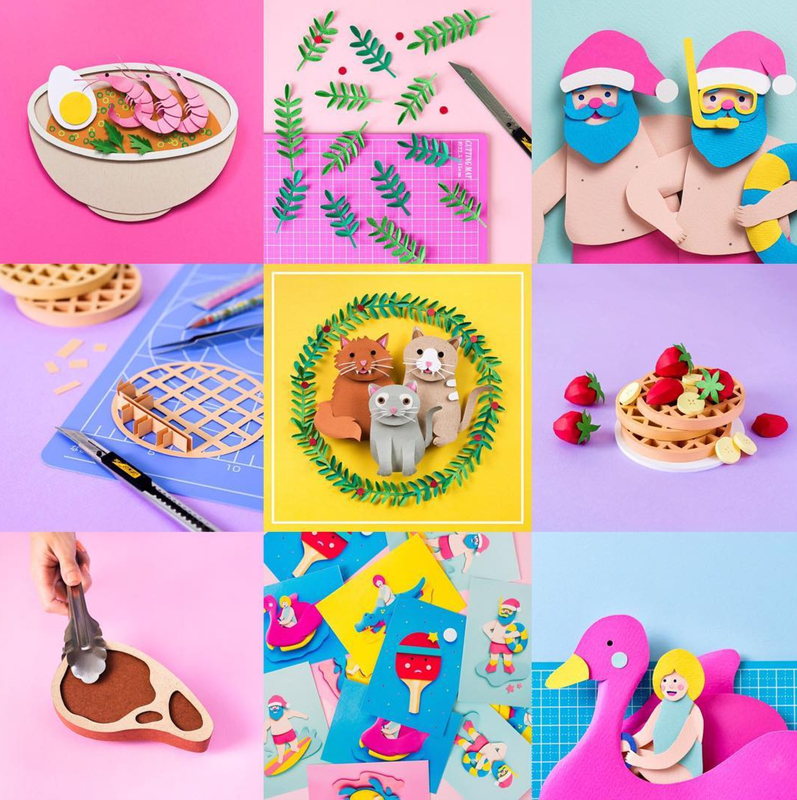 One of the things that gets us really excited about being part of a craft market is discovering other artists who love creating their products by hand. 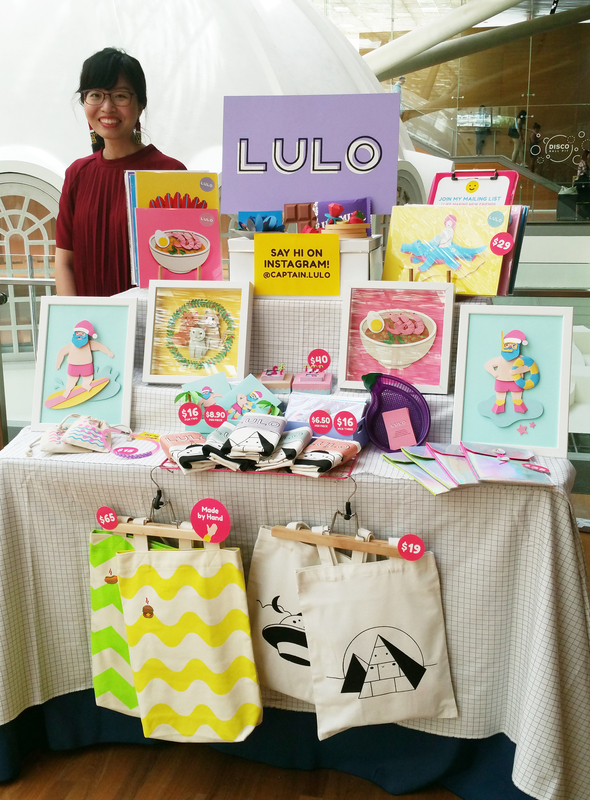 Meet Cheryl, a quirky and talented visual artist and illustrator. Cheryl makes beautiful paper cut illustrations, each one intricately handcrafted and perfect to spruce up your personal space. From paper matchbox dioramas to the space pop necklace craft kit, Cheryl’s collection is always full of delightful surprises. We’re especially in love with her adorable tote bags, some of which are silkscreened and embroidered by hand. If you would like to commission or collaborate on a project with Cheryl, email captain@lulo.space. Christmas is coming! We wanted to make our own Christmas decorations this year since the kids are a year older, and able to do more complicated stuff with mommy. The wreath was actually requested by the children. On the last day of school, they both came home with their own paper plate wreaths made in school. It was very cute, but they wanted something “BIGGER”. So, when i was wandering about spotlight (its almost my weekly retail therapy nowadays… sad i know…), i saw the Styrofoam wreaths and i got them. Here are some simple ideas that you could do to make your very own Christmas wreaths…. Which child doesn’t like those round shiny Christmas ornaments? I don’t know any.. you? So since they love Christmas ornaments so much… a Christmas ornaments wreath it is…. just get the kids to pick out their colored ornaments… i actually had a grand idea of keeping it to a color theme, you know, blue and silver, red and gold etc… but since i said they could pick the colors they want, i have to keep my mouth shut when they literally picked every color they saw at the shop. So the materials you need for this wreath are just the Styrofoam “skeleton”, Christmas ornaments (i used approximately 120 balls of various sizes, yes you read right, one hundred and two balls…), and a glue gun. Now, using a glue gun means the little balls will stay exactly where you stuck them, but it also means, use carefully with children. Mine are old enough to know to avoid the nozzle and handle with care. So all you need to do is just glue away! The kids plucked out the strings from the ends of the balls, and an important point to remember, is when gluing the ornaments, keep the foam flat on the surface you are working on. This is so that the wreath when finished will be nice and flushed against the wall or door. It is actually easier to work with balls of different sizes, so you get a nice textured effect, and also, you get to cover the “holes” up much easier. The kids had fun picking which color i should stick on first and bossed me as to where all the “holes” were. All in all they had a good time and they were super proud of their finished product! While we were getting the round Christmas ornaments, bunches of artificial red poinsettia flowers caught my daughters eye, and she REALLY REALLY REALLY wanted them. Since our tree was full, i said we could use them for another wreath. Surprisingly, this time, she picked all the red and gold decorations! Such fickle creature the little kids….. So the materials we used this time were the same Styrofoam “skeleto n”, artificial flowers and other Christmas decorations, scissors and our trusty hot glue gun. We need to snip the flowers and leaves individually so we can affix them on the wreath. For the leaves, have an assortment of individual leaves and leaves in a bunch. Once ready, we can start gluing. It is basically flower arranging on the foam, you don’t HAVE to lay the foam flat unlike making the ball ornaments, as the flowers and leaves are soft, and will still lie nice and flushed against the surface you hang the wreath. Do take note that you would need to glue the flowers and decorations mostly “hanging downwards” so you can hide the stems among the petals and other leaves. So work from top down, and arrange as you see fit, or as you’re child sees fit. Stick the “bigger” items first, and leave the leaves till last and just use the leaves as a “filler” to cover the gaps. A really simple and quick project that you could do together with the children. Remember playing memory games when you were younger? We would lay all the cards out on the floor and open one by one to find a pair. This is the same game, but i have sewed it out of my kids favorite print. Super easy to sew and suitable for beginners as an early sewing project for your kids. Its great not only for training their memory, but also great for helping with their concentration, as they really need to sit and try to recall where all the “cards” are. Felt or cotton batting if you want the “cards” to be firmer. I used felt as that was what i had lying around the house. 10 different prints for the back (i.e. the pairs). I made 10 sets, hence 10 different prints, but you could make more or less sets. Its entirely up to you. Cut the felt, cotton fabrics into 4 inches x 4 inches squares. Once everything is cut out, take one back and one front piece, face them together (right sides facing each other), and place a felt square on the top and pin the 4 sides together. I use a 1/4 inch seam allowance, and just sew all 4 sides together, remembering to leave about a 2 inch gap (roughly, i wouldn’t spend a lot time measuring the gap out, just roughly do 1-2 inches as you sew depending on how big your fingers are) on one of the sides to turn it right way round. Top-stitch all around the 4 sides to close the gap. And you are done! To make it more challenging, just sew more pairs. I hope your kids have fun playing this. I was in the book store the other day when i came across this book by Herve Tullet. It is such a fun book that i wanted to share with everyone. As you can probably guess from reading our blogs, we really love our books and all three families read books regularly. But it is rare to come across a book that mirrors our art activities, and this book does that. “Mix it up!” is a book that introduces color mixing / blending to toddlers using interactive “instructions” plus some imagination. As the title says, the book invites the children to “mix” the colors up. It gets the children to imagine mixing, smudging, shaking red and yellow and other primary colors together. And when you close your eyes and flip the page….. its ORANGE! Ok, i know i am probably not doing enough justice to the book on how interactive and fun it is. But my 5 year old who knows how to mix his colors to get the secondary colors finds this pretty fun as well. He calls it the magic color mixing book. And he just took it off me again while i was referring to it while writing this post…..
We will definitely be looking to get the other books by Herve Tullet, and i hope you enjoy this book as much as my kids and I have. For those who prefer online shopping, i have included the link to get the book from Amazon.